WASHINGTON, July 9, 2013- Agricultural leaders wanting to bring young people into farming with skills in communication and policy could consider a model established by an English counterpart and founder of the Henry Plumb Foundation. A former Warwickshire farmer and later a Member of Parliament, Lord Henry Plumb told a group of Illinois Farm Bureau members on their 2013 EU Animal Care Study Tour that he wanted to leave a legacy in the form of providing opportunities for young farmers. “I wanted to help young people into farming whether they have a degree or not,” he said, explaining that his Foundation will accept members, generally those between ages 18 and 35, if they show a passion for improving agriculture and possess some natural communication skills. 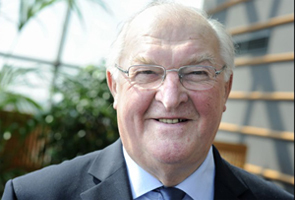 Plumb served as a Member of Parliament from 1979 to 1999, and later as president of the European Parliament, from 1987 to 1989. He also founded the International Food and Agriculture Trade Policy Council, which promotes open and equitable international agricultural trade. In his later years, he decided to focus his efforts on assisting young farmers to succeed as he did, particularly in a world of increasing population and decreasing numbers of farmers. The Henry Plumb Foundation is an enterprise conducted between Plumb and a team of eight influential friends he’s made over the years. Providing the means for young farmers to learn “the importance of understanding regional, global and political influences on food production policy” is a key aim of the foundation. Mentoring positions are a staple in operation of the foundation. Plumb said he has had “stacks and stacks” of mentoring applications, all given by potential mentors willing to work without compensation or travel reimbursements. Helping young farmers to present ideas that will become part of the public policy driving food and agricultural development is integral to the future of the United Kingdom’s agricultural industry, as well as to the efforts of global agriculture in feeding a growing population, he said. In addition to improving communication skills, the foundation helps you farmers understand strong leadership principles and obtain post-graduate training and other learning opportunities. “It’s going to work,” he says.